The ethereal Eclipse coffee table plays with height, texture and functionality – creating a striking visual piece. 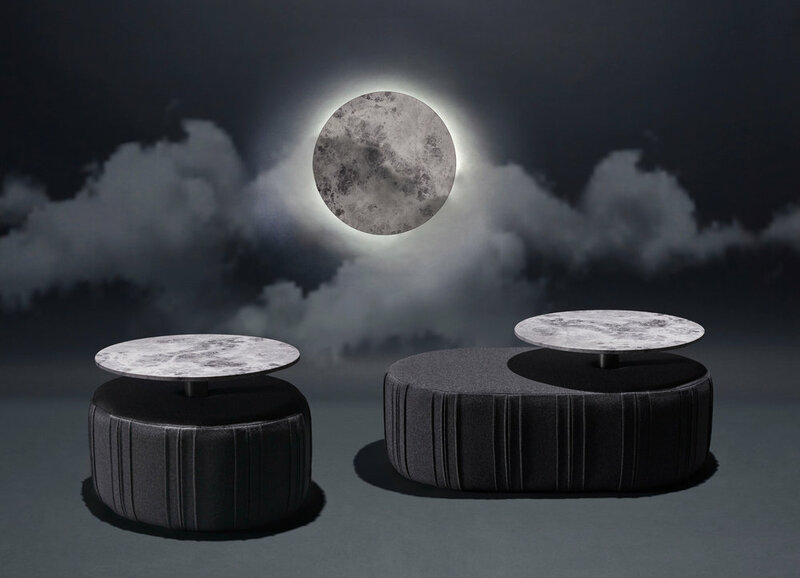 The piece was designed as a versatile element composed of three dynamic parts - a stone top that can change in position, an upholstered base that changes in length and an additional loose side table - to suit different purpose, commercial or residential. 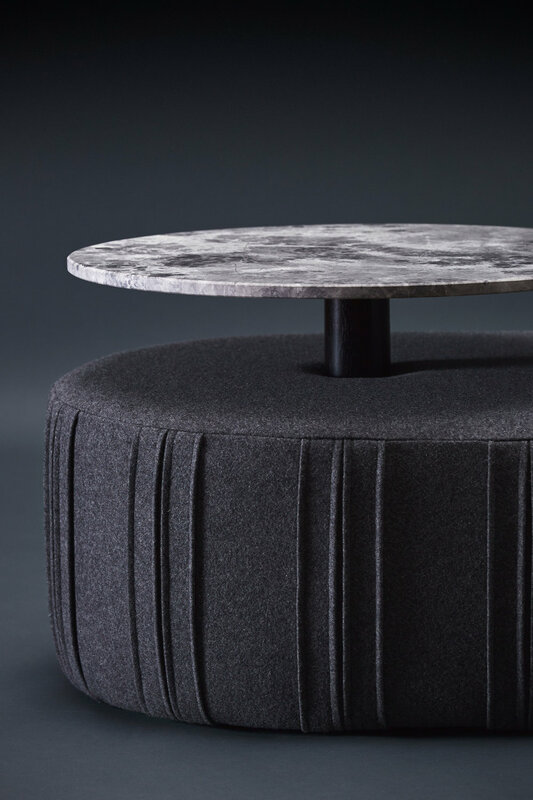 The elevated circular stone top floats above the upholstered base, utilising the shaded space below as concealed storage. As a customisable design, the circular shape of the stone is a fixed form but the position can be shifted along the upholstered base. While the base was developed to be stretched or shrunk in length, alluding to eclipsing forms . The Eclipse base is made of structured, water-repellent woven wool from the Portuguese mountains offering 65 colours. The tactile upholstered vertical fabric pleats of the base that orbit the table are hand sewn by the seamstresses at the burel artisanal factory. The moon-like surface of the Galaxy Dolomite stone, rich in quartz adds hardness to allow the top to be thin at 15mm. The side table is the latest developed component and is an optional piece, derived from the Eclipse shape. This part can be added to complement the end of the coffee table or be a stand alone element catering the room. The decorative filament of lines carved on the timber top alludes to a sundial and passage of time. Working with our local professionals - upholsterer, cabinetmaker, metalsmith and stonemason - we have achieved an elegant blend of beauty and function. The Eclipse and its components are a dynamic and sophisticated coffee table suitable for any sized space commercial or residential. The Eclipse is gracious as moonlight in a room! Available in 65 fabric colours.